Don't dare call him two-faced ... he's actually got three, and this figure has them all! 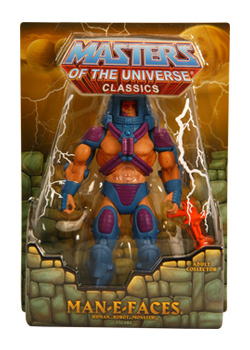 This former actor from Eternia® makes his grand entrance featuring turnable faceplates that reveal three very different personalities. Take Man-E-Faces® from Monster to Human to Robot, all in service of the fight for justice. This fully articulated figure comes with his trademark laser gun, plus a top-secret accessory. Sorry, we can't spoil the surprise, but all will be revealed when you open the box!